(0 Customer Reviews) | Write Review 6 issues per year Knowledge is power, contained within the pages of each issue you will find a wealth of articles written by experts, taking you on a 'bushcraft adventure' even when you can't get to the woods! Bushcraft Magazine is a valuable resource; enhancing your existing knowledge, teaching new skills, answering questions, and keeping you up to date with courses and equipment suited to bushcraft use. There are Regular and Feature Articles on subjects such as Tracking, Canoeing, Knives & Axes, Foraging for Wild Foods, Camp Skills, Fire Lighting, Navigation, Knots, First-aid and Surviving in the Wild, alongside 'How to...' articles, and our ‘Bushcraft on a Budget’ series, both showing readers how to make their own kit, and, projects that use natures resources. There are Book, Course and Kit Reviews to help you select and buy wisely. The News and relevant adverts detail what’s happening and where to go for training and kit. Interest in bushcraft is at an all time high, its profile being raised by the popularity of programs from the likes of Ray Mears, Bear Grylls, Les Stroud, Mykel Hawke and Cody Lundin. All of whom we work with and feature in the magazine. Ben and Lois Orford help you sharpen your knowledge of traditional Scandinavian knives. Nick Greenwood starts our new Canoe building series and Paul Kirtley gives us lessons in walking in the snow in Boreal. Knowledge is power, contained within the pages of each issue you will find a wealth of articles written by experts, taking you on a 'bushcraft adventure' even when you can't get to the woods! 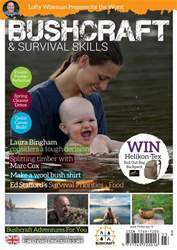 You'll receive 6 issues during a 1 year Bushcraft & Survival Skills Magazine magazine subscription. 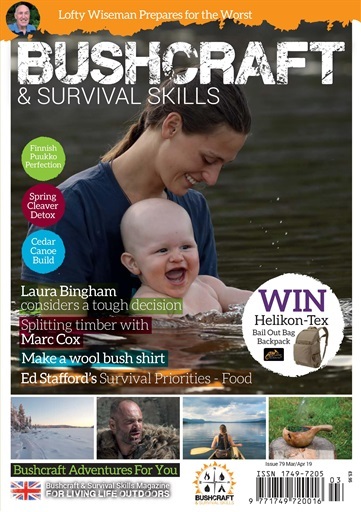 You'll receive 6 issues during a 1 year Bushcraft & Survival Skills Magazine magazine print subscription.